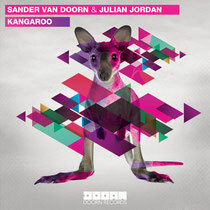 Sander van Doorn teams up with his 16-year old discovery, Julian Jordan, to release their co-produced track ‘Kangaroo’ next month! Sander and Julian were first introduced by their record label, Spinnin' Records, shortly after signing the 16-year old, who was still in high school at the time. Sander apparently recognised a lot of himself at an early age in the first of Julian's productions he got to hear. Sander was very impressed by the quality of Julian's tracks and wanted to work with the young prodigy as soon as possible and the result, after some fruitful studio sessions, is ‘Kangaroo’, a fast-paced high-energy electro house banger! Ever since Sander first spun the record in his Ultra Music Festival set in Miami this year, there has been a lot of buzz surrounding the track, quickly becoming one of the most popular tracks in Sander’s recent sets. It’s already entered the DMC Buzz Chart in pole position, so expect the hype to intensify up to its exclusive release on Beatport on August 20th. Check it out below.